Our proposal investigates ways in which textiles can harness energy from the environment and from people’s interaction to create an airy, inviting public space in Melbourne’s St. Kilda Triangle. As such, WeAVES proposes the use of solar fibers (organic photovoltaic fibers) to harvest energy from the sun, and triboelectric textiles to harness energy from wind and from movement generated by the park’s users. The design takes its inspiration from the nearby ocean. The waves (WeAVES) are both a park and a sculpture: they rise from the ground, creating a plaza and gardens along the Jacka Boulevard; slowly rise and descend into areas for trampolines and public hammocks; and finally continue to rise to create viewing platforms nestled within the crest of the wave. The waves provide the public with several uses and experiences. They include multiple vantage points from which to view the site and nearby shore, shelter from the sun and wind, places to gather and promenade, and the ability to bounce on a trampoline or rest in a hammock. The waves are made from structural steel ribs that rise from the ground surface to become giant looms housing solar fibers, triboelectric fabrics, and batteries for energy storage. On the ground level, triboelectric textiles are woven into permeable, sponge-like, soft walking surfaces that capture energy from footsteps, while allowing rainwater to permeate and be filtered as part of the roof garden system above the underground parking. Inside the wave, triboelectric textiles comprise the trampolines and hammocks, harnessing electric charges generated upon human contact. On the northern portion of the wave structures, solar fibers are woven in a double layer creating a visually permeable surface that harnesses sunlight while allowing views from The Esplanade. Wind energy is additionally harnessed in the “sail-like” fins on the upper part of the wave structure by triboelectric textiles that gently flutter with the breeze. 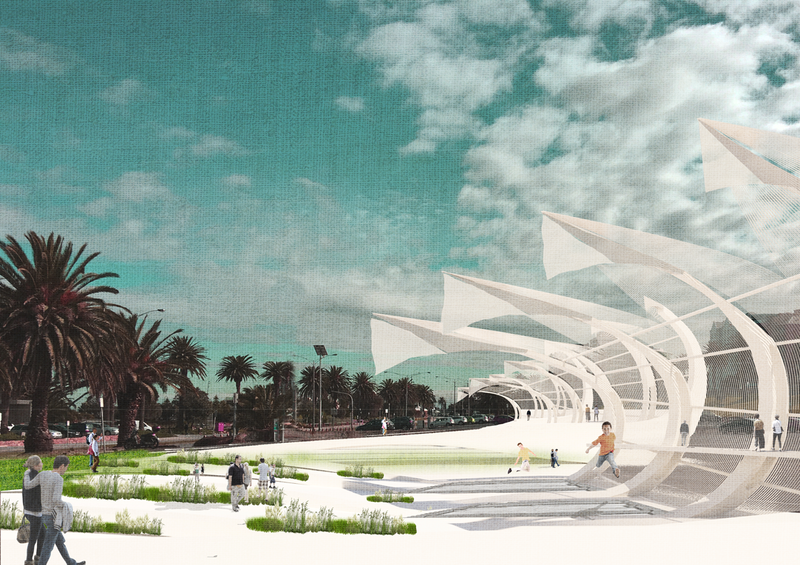 Weaves presents a model for renewable energy production through the harnessing of environmental and human interaction to create a pleasurable public space that increases the connection to the local landscape. By scaling up energy harvesting technology associated with wearable electronics, energy harvesting textiles may become the new power lines to be woven into our cities’ public spaces.